In the interest of protecting your privacy and securing your personal information, cookies must be enabled to shop online at our store. By enabling cookie support in your browser, the communication between your computer and our site is strengthened. To continue shopping online, we encourage you to enable cookies in your browser. Click the "Tools" menu bar. 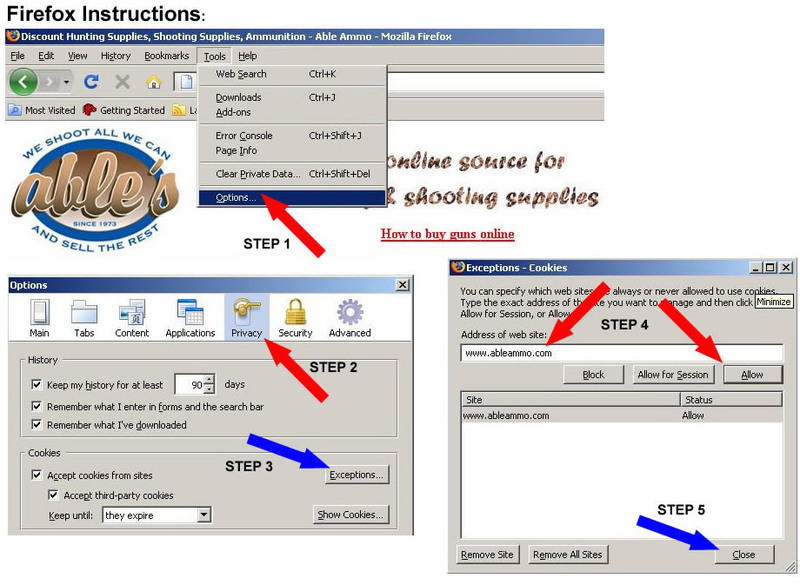 Select "Allow", you should now see www.ableammo.com listed in the box below. Select "OK" to close the box. From the dialog box, select "Privacy". Find "Cookies" in the middle of the panel, and click the "Exceptions" button. Select "Close", then "OK" to close both boxes. Please contact us if you have any questions relating to this requirement, or wish to purchase products offline.